A recent trip to Vienna for a Central & Eastern Europe Finance Forum (don’t ask) was enlivened by the discovery of Wilhelm Jungmann und Neffe. 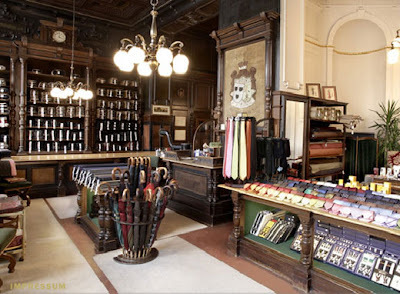 A men’s outfitter of the first order, it has been supplying accessories, cloth and tailoring services to central European gentlemen for over 125 years. I didn’t hold out much hope when I strode out from the Hilton Vienna into the clear, crisp sunshine. A break from lawyers, some nice architecture and perhaps a quick coffee in a square-side café. Any retail interest would likely be restricted to small shops stocking Zegna suits, Falke socks and re-branded Drake’s ties. The problem with living in London is that there’s precious little you can’t buy there. Paris is good, there’s always discoveries to be made in Milan, Naples or Rome; but that’s about it in Europe. Vienna, at first, seemed to be living up to my expectations – one shop with nothing of any quality, another with some Pantherella socks on sale. Then, in the grand setting of Albertina platz, I saw the windows of Wilhelm Jungmann und Neffe. Good window displays are always a welcome sign. Someone inside clearly has a sense of colour, as well as taste. Among my favourites are Bergdorf Goodman, Turnbull & Asser and – surprisingly the most consistent for colour – Hackett. Now I’ll add WJN to the list. Yellow umbrellas with tan wooden handles. Camel-coloured jackets and cashmere ties in subtle brown checks. Suitings in pale grey with delicately placed gold paisley handkerchiefs. A themed and inspiring window – and there were three more. WJN is best known locally for its fabrics, which are imported from England, Italy and locally in Austria. 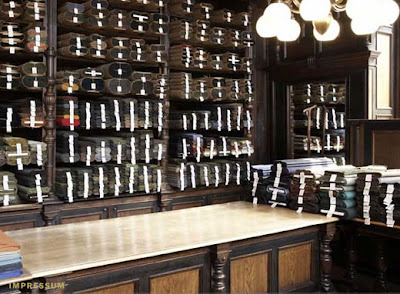 Several bespoke tailors operating in Prague, Bratislava and Budapest visit the shop in order to cater to clients, rather than there being a dedicated tailor on site. But I was most taken with the accessories. The cashmere scarves and shawls came in 15-20 colours and a similar number of patterns, from the basic to the funky. The staff were particularly proud of two recent acquisitions – one Italian double-sided scarf picked up in Pitti and another design commissioned from some locally in Austria. Most of all, this is a personally edited and locally sourced collection, which is what makes it worth visiting for someone from London, Milan or Paris. The madder ties, for example, are made by a company just outside Vienna. The store manager said it was the only one still making madder outside England. I didn’t buy one of those ties and I regret it now. Perhaps I’ll find another CEE Finance Forum. You can follow the discussion on Jewel in Vienna: Wilhelm Jungmann Und Neffe by entering your email address in the box below. You will then receive an email every time a new comment is added. These will also contain a link to a page where you can stop the alerts, and remove all of your related data from the site. Looks like a beautiful building. There’s always something nice about shopping somewhere where everything has been carefully selected, so that the shop is more than just the sum of what it sells. Interesting clip on this video….. about 5mins 45sec in. Damn this looks like a serious place. I’d love to check it out! It is a wonderful store!!! This is the store that turned me bespoke!!! After the 1st visit I was sunk!! 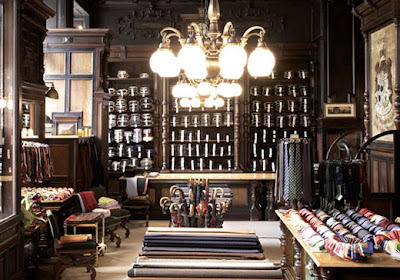 I have a scarf from this beautiful store, and wish I could browse and purchase more. The window setting was for autumn with copper, gold, and purple. It was a stunning display and I found my scarf from that window! It’s still my favorite! I was in your beautiiful store and was wiaited on the first day by a lovey women and on the secondday another lovely women. I was in he market for a scarf-Blue Silk with black popper dots with a blue background. I think, casheme on the back. The price of the scarfs 240 euro. M y question is this do you have another one similar t what I hae described? If so, is the price the same and could you send it o me?